This Mission style Corner Gun Cabinet has a simple but attractive look and offers ample storage space for your hunting rifles, shot guns, and pistols. 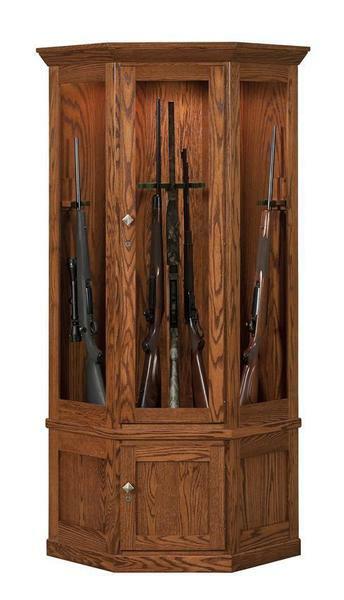 14 guns can be easily stored inside this wooden corner gun cabinet. The unique rotating gun carousel in the center holds up to 12 guns to easily access the rifle or shotgun that your looking for. The double muzzle gun prop on the left and right sides will hold an extra two guns so your entire firearm collection will be safe, secure, and handsomely displayed inside this handcrafted corner gun cabinet. Security locks are standard on this Mission Gun Cabinet to keep you and your family safe by keeping your firearms out of the reach of children or any other unauthorized individuals. The bottom cabinet area is a convenient extra storage space that can be used to store ammunition and other hunting accessories. Choose from oak, brown maple, or cherry as the main wood type for your Amish handcrafted gun cabinet. The cabinet is then finished in your choice of a variety of stain or paint options. The wood type shown is an oak wood with a Michaels Cherry finish. Have yours built in the same wood and finish combination or choose your own combination to have it match your other home furniture or style preferences. You also have the option of having hunting scenes etched onto the double strength glass gun cabinet display doors. For additional strength and safety upgrade your glass doors to tempered glass. The lighting options available will provide a premium presentation of your treasured firearm collection and the final product will be an heirloom quality American made custom gun cabinet that will look great in any room of your house! Call today and talk to one of our friendly sales associates with questions or ordering assistance on this expertly crafted Amish wooden gun cabinet. If you feel more comfortable ordering online use our safe and secure online check out.